Ready for our Exciting Autumn Training Program? 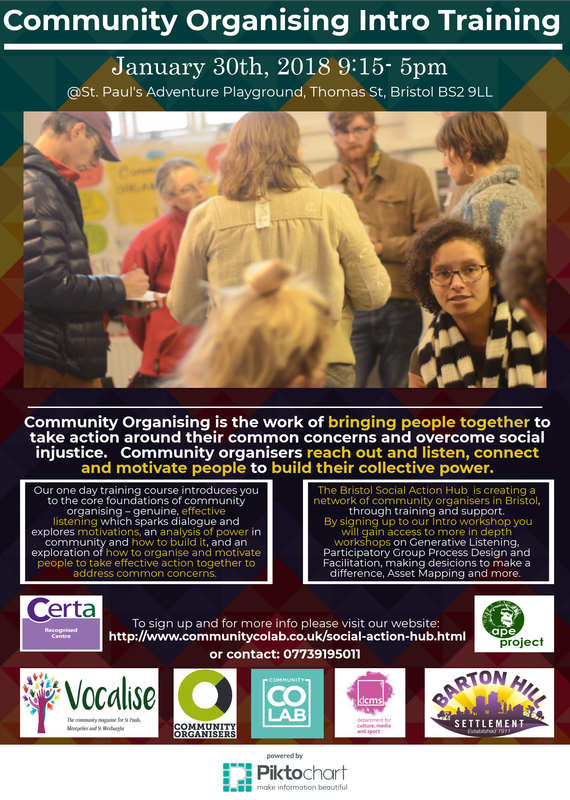 Why should people come to our Community Organising Intro workshops? The Bristol Social Action Hub is creating a network of community organisers in Bristol, through training and support. By signing up to our Intro workshop you will gain access to more in depth workshops on Generative Listening, Participatory Group Process Design and Facilitation, Decision Making, Asset Mapping and more. We have fresh new dates for our free Introduction to Community Organising training sessions for the first quarter of 2018!! ​Visit the link above to find out more!! The Bristol Social Action Hub is a part of a national movement of organisations supported by Community Organisers Ltd aiming to bring together people and organisations interested in exploring community organising as a toolkit for social change. Community organising is a practice which engages people where they are employing active listening, powerful and challenging questions as well as stories of change to open generative conversations which aim to activate people into being the change they want to see, supporting the creation of networks and the building of power within communities to really engage with the issues faced through a collective approach which seeks win-win solutions. community organising is about building trust respect, relationships and collective responsibility. There are many models of community organising, some more confrontational than others. Community organising is more than just an approach to engagement, the point of it is to really build the power needed within people and within communities to take action. This is followed by encouraging and supporting potential leaders to bring people together around common concerns and ideas, providing participatory spaces for people to engage with each other in deep conversation to discuss all possibilities and create common ground. A Community Organiser doesn't provide answers and solutions but supports the creation of the right conditions for people to self-organise, set their agenda, their strategy and learn by doing, using an ongoing cycle of action-reflexion. The Bristol Social Action Hub is run by The Barton Hill Settlement in partnership with Community CoLab. Initially we will be providing a number of Intro to Community Organising trainings, to begin to create a network of practitioners which will receive support from Community CoLab to put their learning into practice. We will then explore other training needs for the growing members of the hub so that we can tailor other training sessions which will aim at continuing to build the capacity of the members whilst generating opportunities for deep connection, cross-pollination, and networking. Our training sessions are free to most, we ask participants coming from medium and large organisations to give a voluntary donation which will be put into a pot which hub members can access as seed corn funding to deliver organising drives and emerging social action projects. To be kept up to date with when and where we will deliver sessions, please subscribe to our newsletter.